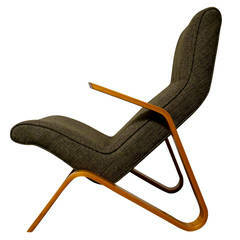 Eero Saarinen Grasshopper Chair for Knoll. Midcentury Danish modern design chairs by Erling Tovits. These high quality rosewood chairs was manufactured by Sorø stolefabrik in the 1960s. Eight model 611 chairs in birch with linen webbing by Alvar Aalto, Finland. We have a set of 15 chairs by Eero Saarinen for Knoll. Upholstered in Stripes by Paul Smith ($135/yard). We can sell in smaller lots if desired.